Spectra: Spectra taken Oct. 15.75 UT by R. K. Das, N. M. Ashok, and D. P. K. Banerjee, Physical Research Laboratory (PRL), Navrangpura, India, and by M. Fujii, Ibara, Okayama, Japan, on Oct. 16.43 UT indicate a classical nova early in decline. Chart: A chart has been prepared by Reinder Bouma and is available at http://shopplaza.nl/astro/vs-charts/v477sct.png Reinder revised his original chart posted at this address; be sure to use the chart with "_revision RJB14102005_" in the header. a. 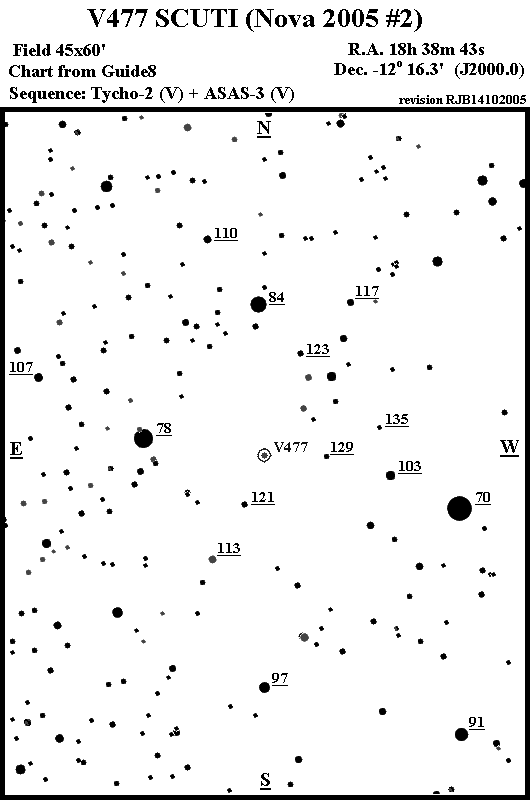 Discovery details from IAU Circular 8617 (ed. D.W.E. Green) unless otherwise noted. b. Pojmanski notes nothing was seen on at this position on Digitized Sky Survey images, though the USNO-B1.0 catalogue lists several faint objects (red mag 19 or fainter) around this position. Also, nothing was visible at this position on an ASAS image taken on Oct. 7.055 down to CCDV magnitude 14.
c. N Sct 05#2 has been named V477 Sct, according to N. N. Samus, Institute of Astronomy, Russian Academy of Sciences. Congratulations to G. Pojmanski and K. Haseda on their independent discoveries!